Babbling about books and plants. My best friend is still laughing at me for my ivy obsession. 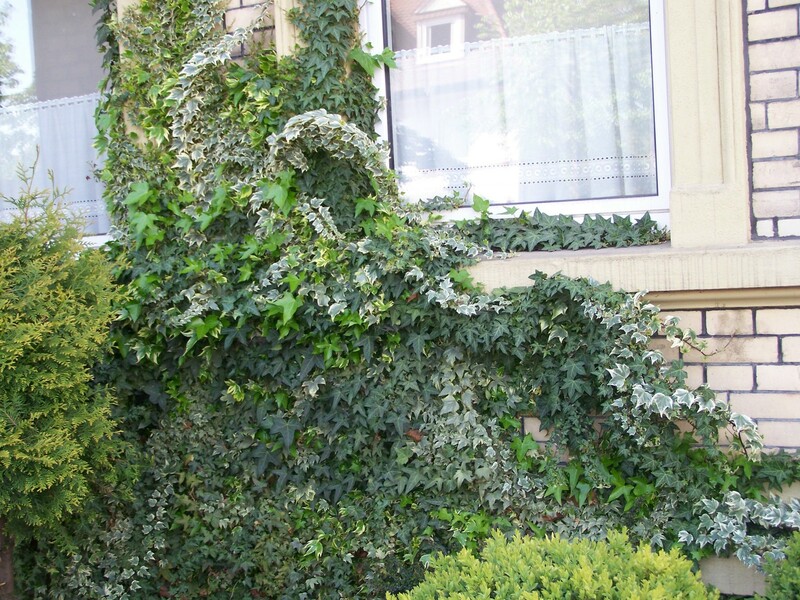 She won’t let me forget that when I was younger, I didn’t like Common Ivy (Hedera helix) at all – I knew it mostly as an outdoor plant, turning houses dark and sinister. 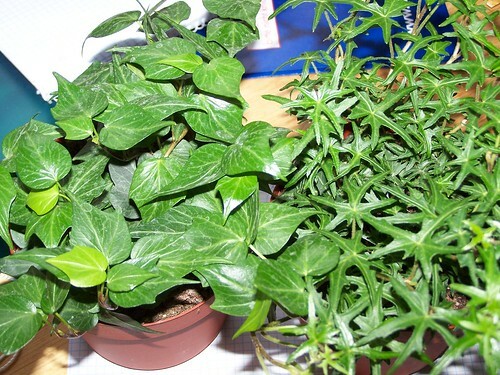 I much preferred the bright green cheerfulness of Boston ‘Ivy’ and Virginia Creeper. The change of attitude came during my winter in Vienna. Fresh out of grammar school, I had been talked into going to university there. I didn’t know what else to do, so I went along with my parents’ suggestions, but I wasn’t happy there. Looking back, maybe it was actual depression. But as with most things in my life, this unhappy winter eventually led to good things. I saw little more of Vienna than the train station, a supermarket and the mile or so between my dorm and my university. A mile that led up a hill and down again, past villas in their large and winter-bare gardens. 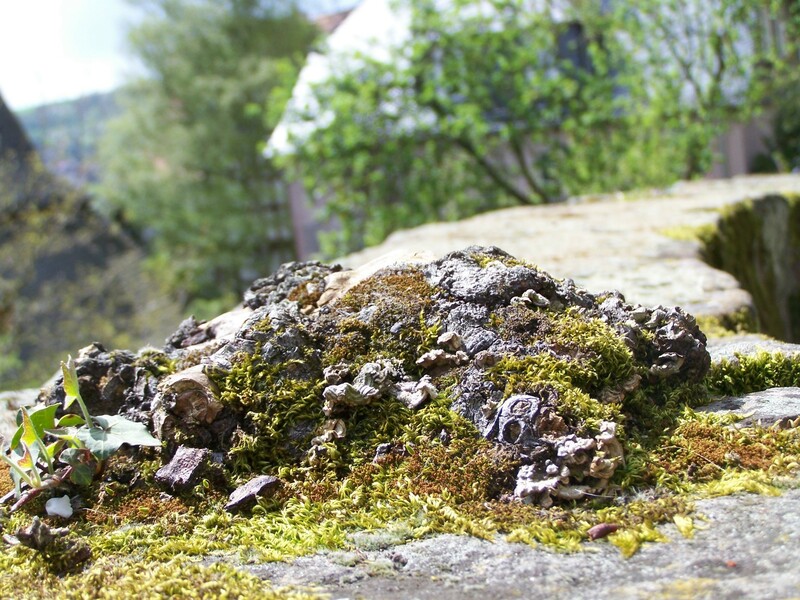 And in almost each of those gardens, creeping over walls and growing through fences, there was ivy, the last stubborn green between the bare branches, the dull greys and browns of winter. On many mornings, the frost-sparkling leaves were frozen stiff, breaking when I picked them. But if I gently warmed them between my fingers, they became soft and supple again, as alive as they had been in summer. But what struck me even more was the shape. 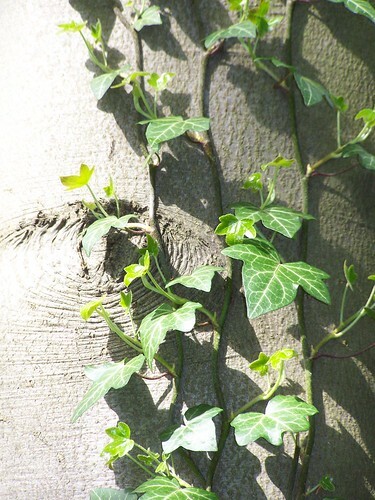 While I knew beyond doubt that it was ivy, it looked so different from the leaves I was used to. 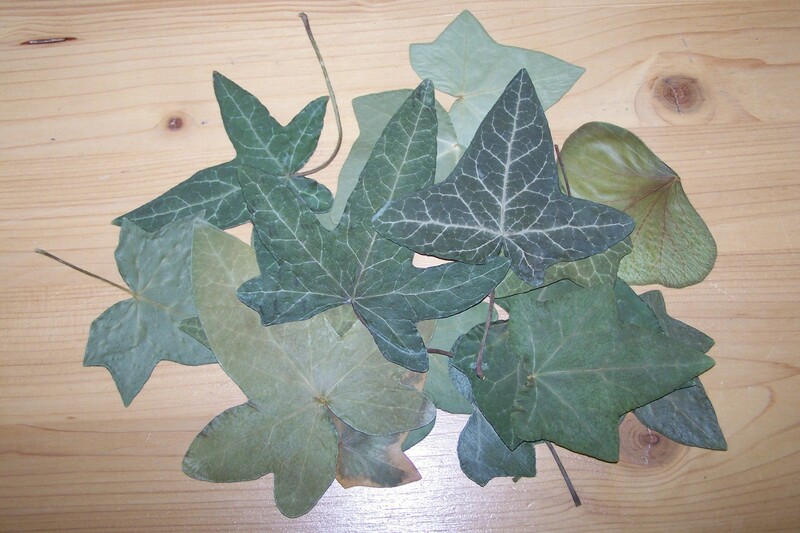 At home, ivy leaves were broad, with five rounded lobes. These were smaller, narrower, pointier – a slender triangular shape with only three lobes. 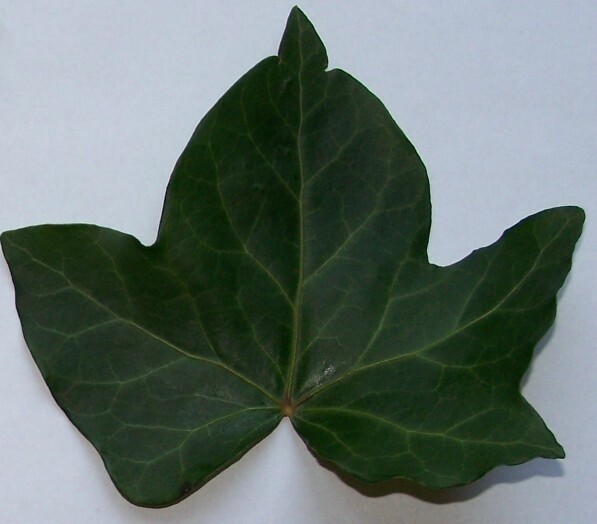 Now that my interest was woken, I looked at the ivy leaves more closely, noticing the differences in the leaf shapes – greater differences than, say, one beech leaf has from the next, but still maintaining the overall narrow shape I still think of as Viennese Ivy. Here’s where the Leaves and the Letters become so hopelessly tangled that I can’t say for sure what came first. I was just getting back to writing, the exhaustions from my end-of-school exams having worn off. A plotbunny that had been smothered under schoolwork the previous spring began to twitch feebly. At first it was only a bedtime story I told myself as I lay awake in my dorm – frequently astonished by the strange things my characters did. A few weeks later, the plotbunny woke up fully, forced a pencil into my hand and told me to write. What does this have to do with ivy, you ask? Quite a lot, because the story would not be the same if one of the main characters hadn’t decided to be part of a group called the Ivyleafers – the Enaguodyciünaylaylo in his language. (Yes, the word needs quite this many letters, and yes, I can actually pronounce it.) A group named for their habit of wearing an ivy leaf – in their mythology, a symbol of perseverance – somewhere on their person. But who was first to wear it? Lionno in the story, or I in Vienna? Was it first only a night-time musing, or a spontaneous idea as I trudged along the dreary streets to some morning lecture? But what is for certain is that during this winter, ivy became the symbol of perseverance, and that is why I did wear a leaf tucked into my hair, touching it whenever homesickness threatened to overwhelm me. I never threw the leaves away. Every night, I taped the one I’d worn that day to my dorm wall, next to my bed, where they dried up but, instead of turning brown like every other leaf, maintained their green colour. I left Vienna at the end of that winter, giving up any pretence that university was ever meant for me. 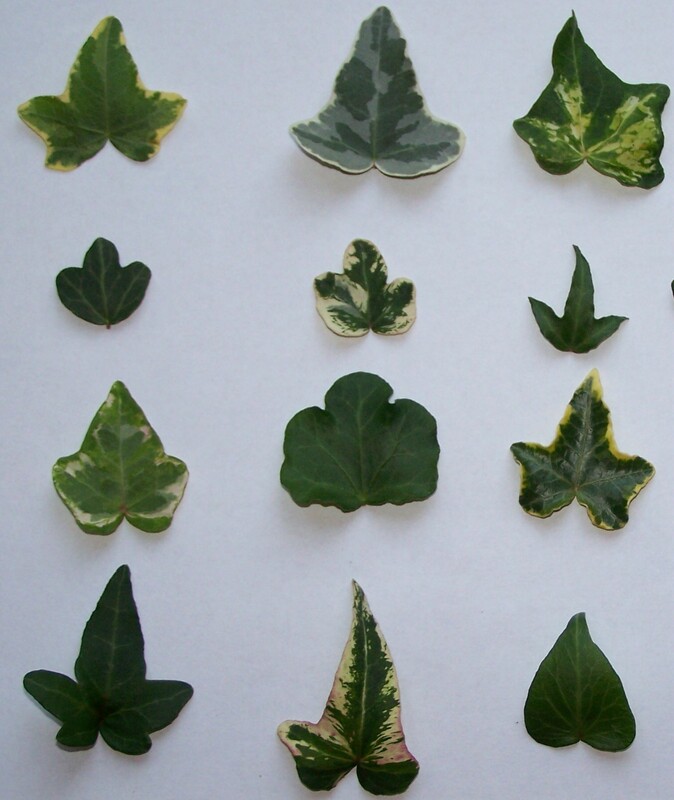 I took with me my love for ivy and a habit of keeping an eye out for unusual leaf shapes. I didn’t wear them in my hair any more, but still picked them and tucked them into whatever notebook I had with me. 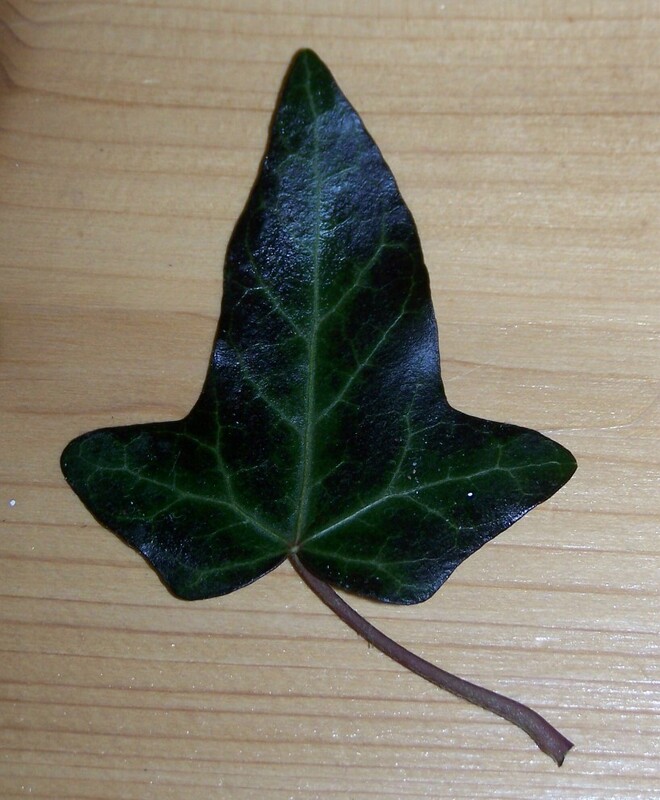 Four years later, I still find dried, pressed ivy leaves fluttering out at me when I open them. 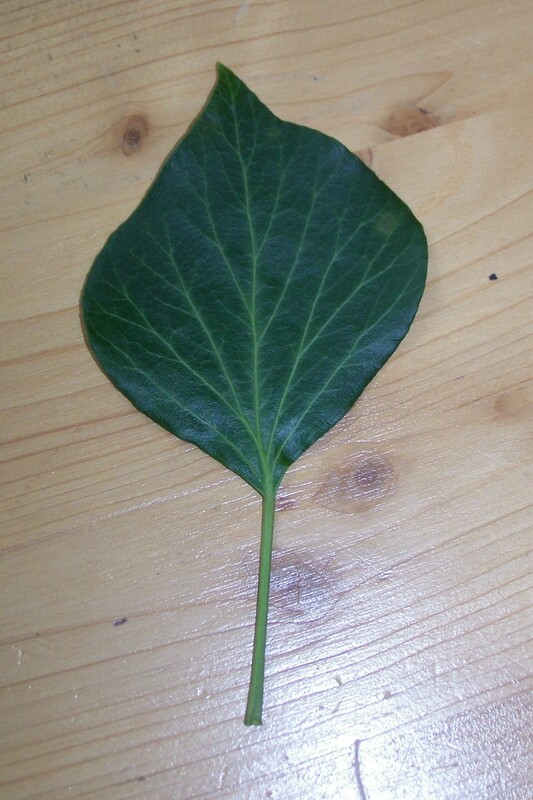 What doesn’t count as unusual leaf shape, is the rhomboid one of the adult leaves – I’ve known about that change in shape since I was thirteen, possibly twelve. Which doesn’t mean it doesn’t still fascinate me that one plant can look so different. I still wonder why I didn’t take pictures of what I saw during my first trip to the Netherlands. “Oh, Wow, look at that ivy,” I said as we left the Zaanse Schans museum. But by spring 2008, I had definitely started collecting – I distinctly remember that day I went to the DIY store and walked home through the spring forest, looking very strange: camera around my neck to snap pictures of wood anemones and corydalis, index cards with plant pictures in one hand and muttering botanical names as I stared at them, and clutching two ivy plants with the other hand. Marburg: Ivy 'stump' growing in a wall - cut back countless times, and still growing. 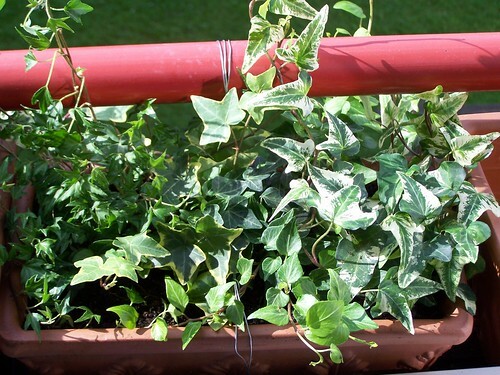 When we had to move in June, I had seven different small-leafed ivies. While I sorted through my possessions, tried to get the plant collection down to a manageable size and packed up books, the small collection was grouped together in a too-dark corner of my too-dark room. Naturally, they got spider mites. The most I could do for them at the time was cut them back, wipe them down and put them on the shady and relatively cool porch. Where they were once again ignored while I dismantled and rebuilt furniture and carried box upon ridiculously heavy box of books. By the time I came to pick up my plants, they had been killed by over-and underwatering. Even if I hadn’t been unhappy about moving before, I certainly was then. But since I was now living within walking distance of a garden centre, I set to rebuilding my collection. It appears to have been a good idea. It has its drawbacks – watering is a hassle (two rows of plants on the inside sill and a mosquito net that need to be removed), and I’ve had some frost damage – but there hasn’t been a single spider mite, and the aphids I had last summer are easily squished. The biggest problem is that the different varieties are all tangled up and I have no idea what I actually have and what I don’t have, and what might have died. My most recent purchase - I've been looking for this one for about two years. 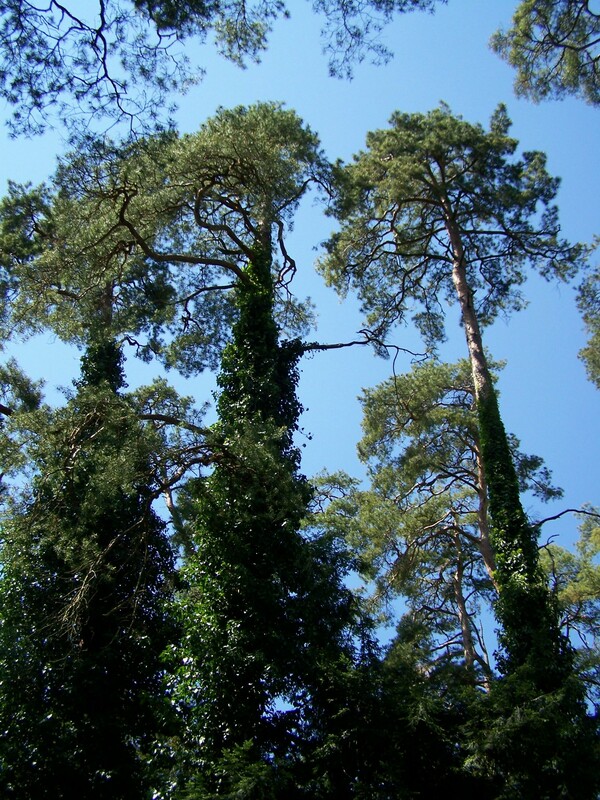 I wish I could claim credit for the title of this post – but it’s not a pun I’ve come up with – it’s a typo from the list of plants we were supposed to know for our apprenticeship finals. 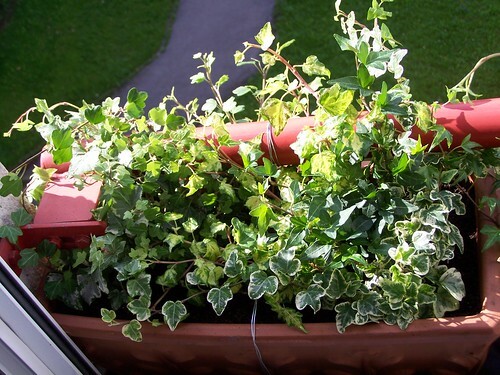 I found it rather entertaining – “Hedera felix“, the “Happy Ivy”. It certainly makes me happy, and to make it even funnier, “felix” is often associated with the name of my country – “Bella gerant allii, tu felix …, nube.” I’d offer cuttings of your favourite ivy to anyone who can complete this sentence without Googling it, but I don’t know how that would work, shipping-wise, for the overseas folks. I can’t recognize more than those two species, either. And I have NO idea what any of my varieties are called – I should probably try to find out, but I’m afraid I’m too lazy. 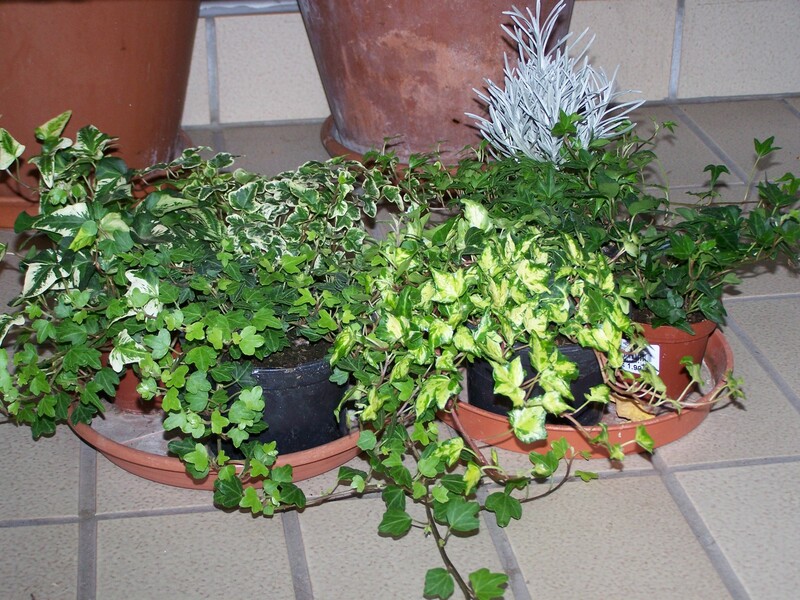 Check out if you wish my own Hedera Felix… Its a very common species in Greece! 23 years of learning languages. 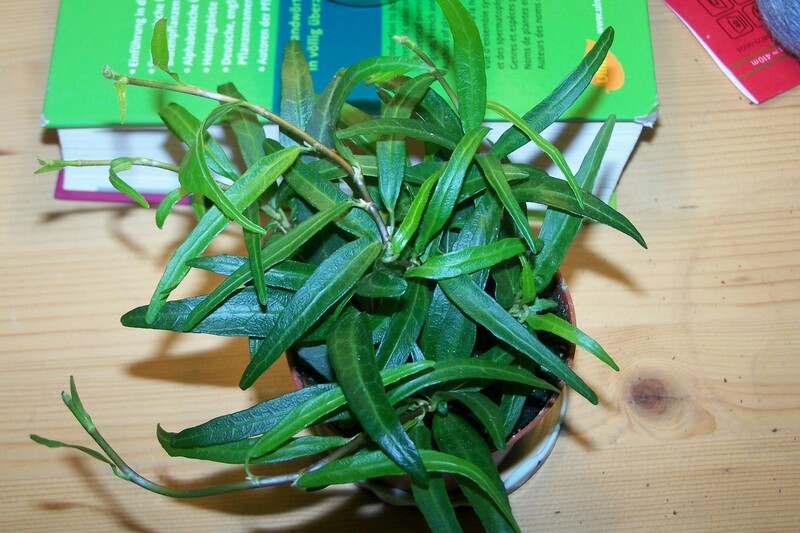 15 years of collecting houseplants. 8 years of working in horticulture.